I LOVE my cardiologist. Although we might not agree on everything, he is willing to sit and discuss stuff with me in detail as no other cardiologist has ever taken the time to do. He is 86 years young, and still practicing medicine at the Mayo Clinic Rochester. Talk about an inspiring person. 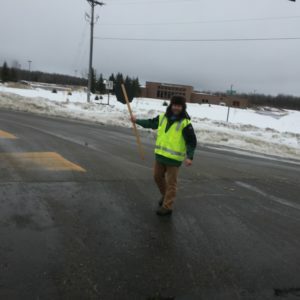 I hear from all the staff he works with, about how he sees more patients in a day than most other doctors… Not because he spends less time with his patients, but because he never sits still, often working through lunch, and staying late into the evening. On the day of this last visit, he worked through lunch to see me, still spending upwards of 45 minutes discussing my case. There is no doubt in my mind that he does what he does because he has a passion for saving lives, and he loves people. Not all doctors are created equal in this respect and I would urge anyone not happy with their current doctor to look for one they feel is truly interested in their recovery, not one just going through the motions of meeting their quota of patients and scripts. I think it’s also important to realize that no matter how well-intentioned our doctors are, they have many limitations placed on them by the medical system. If they do not tow the line so to speak and stay within the pre-described boundary’s set by the institutions they work for, they will not be allowed to practice medicine anymore. So don’t expect to find any doctors willing to support and prescribe healthy lifestyle measures alone, not because lifestyle measures do not work, but because this is simply not how your doctor has been trained. They must use only the tools given them in the toolbox provided them so to speak. Any variance from this could very easily ruin their career. therefore, do not expect them to jump up and down for joy when you start seeing result they can’t reproduce since your using a tool unavailable to them. Good intentioned or not, they can’t offer to the rest of their patients a tool that’s not in their toolbox, just because it worked for you. 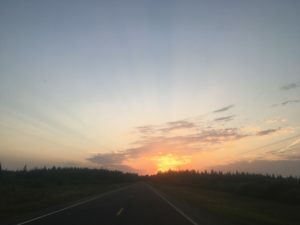 When I first started seeing results, I really thought the doctors would share my enthusiasm but this wasn’t the case, instead, the results I was getting through the tools I was using actually drew discouragement from some of them. I found this very disappointing/disheartening in the least, but, like it or not, this is just the way this medical system is set up. Not always the fault of our doctors. For the record, I personally think our current health care system is in complete crisis and needs a makeover. It has evolved into a serious money-making machine while the definition of “health” and “average”, has been continually redefined, setting the bar lower each time. Not because the doctors are greedy, but because the controlling 1% are. That greed is the reason most doctors are forced to practice using only the studies published and approved by the status quo so to speak. Do not expect to see your doctor interested in chasing after or mining results from the few people actually seeing RESULTS in long term cardiac care if those results came only through the adoption of a healthy lifestyle and were not the result of medications and medical procedures. Results obtained through lifestyle measures are very unprofitable. The corporate quagmire our health care industry has shortly exploded into has completely tied the hands of most good-intentioned doctors. The top priorities of these corporate beasts are to their shareholders, not your health. According to the law of the land, at least here in America, the officers of these corporate money making machines have a fiduciary duty to their shareholders. Part of that duty, again, according to the law of the land, is to turn a profit. The care we receive is secondary to these profits. While strolling through the Mayo Clinic, (a not for profit corporation), It’s hard to not admire the assembly line type precision they have brought to medicine, whereas 100’s’ of people are able to move through all sorts of various appointments so quickly and efficiently, accomplishing in half a day what would take many days and visits to accomplish at most regional healthcare facilities. I also can’t help but notice all the lavish appointments. The place is simply breathtaking to anyone checking out all the architecture and art that is present on every wall, nook and corner. Seeing all these lavish architectural appointments and beautiful art hanging through out the place and I can’t help but think to myself, “what a money-making machine the mayo clinic is”. I’ll bet if they had shareholders they would be very pleased. But what about the rest of us…? Should we be pleased with the obvious amount of wealth this institution has generated off sickness…? (11.6 billion in total revenue at the Mayo Clinic last year alone). How many people have been turned away because they could not afford the price of this care…? How many of them may have died in the process…? I can’t help but ask myself these questions, and a lot of others along these lines. There is a magnificent 28 foot, 6900 pound, cast bronze statue of a man that hangs off a glass wall down on the subway level of the Gonda building at the Mayo Clinic, Rochester. It is supposed to represent freedom and self-expression according to the little bit of history I read about this statue. Personally, when I look at that huge hanging statue, I see health, fitness and wellness, all rolled into one. I see a statue of what I perceive as a near perfect looking human body. But then I lower my eyes, seeing the 100’s of people all around me, and they seem to have nothing in common with this statue. Sickness is all around me, even much of the staff look sick in comparison. Based on what I am seeing, I can’t help but wonder if we have sold ourselves short, accepting a lower standard of health that does not even begin to match our potential or depict what I see that statue standing for. This is not only sad, but appalling in the least. Before going to this appointment, I knew my cholesterol numbers would most likely be considered SUPER UGLY to anyone not following all the rapidly emerging science on the subject of statin use and cholesterol numbers. Most of the newer science on this subject disputes the current standards, but is not mainstreamed and in fact marginalized at best within the medical communities. Just so everyone knows, I love intelligent discussion/debate on this subject, but before I will discuss statin use and cholesterol numbers with someone, let me please first insist/urge them to personally research and follow the money trail being generated from these statins, while comparing who holds all the financial gain and wealth from the sales of the statins, along with who’s studies are being used to set/vet the current standards for statin use, both in academia, and in health care as we know it. Then, please educate yourself about the dark side of statins, learning all you can about the deleterious side effects and deaths that often accompany their use. By doing this, you may very well start seeing a very different picture then what the doctor and currently published information has painted for you. From there, read some of the many books now written on the subject from the many authors opposing statin use. Many of these authors are highly regarded, fully credentialed Physicians, and Biochemist’s. It is by no means an open and shut case when it comes to statin use, or cholesterol numbers. My personal experience seems to collaborate a lot of what some of these authors are claiming in their books on statin use. I personally experienced just how debilitating statin side effects can be. No secret there either. All the side effects I experienced are listed in the handout. Thankfully I only experienced 3 of the many side effects listed on the hand out including but not limited to, muscle pain, liver damage, neurological damage, increased blood sugar, type 2 diabetes, ect. Once damage to the body is sustained in the form of these side effects, again speaking from personal experience, I can tell you it is very hard to reverse this damage and it’s a lengthy process. The damage may not always just go away upon discontinuing statin use. In the case of the muscle damage I incurred, I lived with the consequences for another 4-5 years after discontinuing the statin. Under current guidelines for cholesterol numbers, my numbers have always been considered dangerously elevated. Even after compliantly consuming a whole foods plant based diet for a good number of years, my numbers we’re still notably higher, then the range considered acceptable under current health care standards for a person with my history of cardiac maladies. Prior to following the plant based diet, I followed the make-believe heart healthy, low fat, low sodium version of the “standard American diet” as now recommended by most cardiologists under USDA, and AHA recommendations, along with 80mg of Lipitor and an assortment/cocktail of 12 other prescribed medications. The cholesterol numbers produced when I was tested back then were actually elevated more than my current numbers. So even though the numbers from my latest lipid panel are considered dangerously elevated according to current standards, these numbers are in fact lower than any numbers ever noted during both my early days of doing nothing, and my days on statin therapy, back when I followed the current recommended low fat/low salt standard american dietary guidelines. I was diagnosed hypercholesterolemic in my early 20’s, although no statin therapy was ever used until just a couple years prior to having the infarction that kickstarted this journey. That fact alone should spar/provoke serious discussion/debate into the effectiveness of statins, but it never seems to. Two years on a statin and then out of the blue a heart attack at age 42…? I’ll save that discussion for a later time. Might be a little too deep for some who have not taken the time to read both sides of the science now being presented on this subject. As much as I love my doctor at the Mayo Clinic, we do not always see eye to eye and this time was no exception. He made it very clear that he was unhappy with my cholesterol results this time around. He urged me to stop following a ketogenic diet, and return to a plant-based diet. Maybe I should consider this a win, since that last visit two years ago, I was discouraged from following a plant-based diet and encouraged to follow the standard American diet. My total cholesterol numbers as tested on that visit two years ago, Total Cholesterol 202, Tri 59, HDL 52, LDL 138. On that visit, same as this visit, he recommended statin therapy, and I declined. Despite elevated cholesterol numbers that I knew would be elevated this time around, this trip gave me and my heart something to truly celebrate. It was the first time on this entire journey with a wounded heart, (10 years this October), that I was seeing first hand, clinical proof of improved heart function in terms of my hearts ejection fraction, along with an increase in my max heart rate. On the previous Nuke Stress performed on my last visit two years ago, my max heart rate as recorded was 168. 168 would be considered the appropriate/average heart rate for a healthy male of my age. This time around, my max heart rate was up to 189, a number much higher then average. My ejection fraction, (the amount of blood the heart is able to pump with each beat), remained hovering around 35% for over 7 years, before slightly rising to 37% just two years ago. This visit produced a test result of 45%. I am very excited with these results. I couldn’t help myself from asking the doctor the question, “how many of his other patients successfully raised thier max heart rate to a level considered above the average, while improving an ejection fraction that had remained unchanged since that first myocardial infarction almost ten years prior”…? His response, (again, short and to the point most likely because of all or some the reasons I wrote about above), was that I was “truly a unique patient”… His smile and the way he was shaking his head while very carefully reviewing the data in front of him spoke more to me then his words ever could have. However, there was also no doubt that he remained somewhat fixated on the cholesterol results , making this point pretty clear. He encouraged me to return to eating plants knowing full well my ketogenic diet experiment was the reason for the high cholesterol numbers while recommending I take two different types of cholesterol lowering medications. I respect his opinion and will see if can lower those numbers a little, but I will do it by making subtle changes to my macro’s/ketogenic diet, not by popping statins. What follows are the posted RESULTS and notes from my recent Mayo Clinic visit… Please stay tuned for my future cholesterol results as I tweak my diet and retest in a couple months. General: He appears quite fit. well groomed. Psychiatric: Normal mood and affect. Oriented to person, place, and time. Eyes: No periorbital xanthelasma. Clear sclerae. ENT: No oral mucosal cyanosis or pallor. Heart: Examination of his heart his normal I hear no murmurs or gallops. Vessels: Jugular venous pulse is normal. No carotid bruit. Lungs: Clear to auscultation. Good air movement bilaterally. Abdomen: No hepatic enlargement. No masses or tenderness. Musculoskeletal: No clubbing or cyanosis of the digits. Skin: No stasis dermatitis or ulceration of the lower extremities. Sodium, potassium, bun, creatinine serum, all well within range. The night before my first race on skis found me lying in bed wanting to sleep, but wide awake with a ton of different feelings running around in my head. 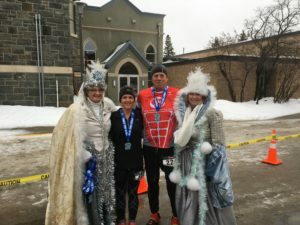 Being able to tackle something as physically demanding as a marathon on skis despite my wounded heart stirs a lot of emotion, making me reflect on the times I was told by doctors that I was dying of heart disease and all they could do was try slowing it down. I was told I needed the 13 different medications to stay alive for any length of time, and would need to take them for the rest of my life. The medications left me so tired that I spent most of my time siting on the couch missing my old life. All my doctors were very quick telling me I needed to take it extra easy and slow. Short walks were ok and encouraged but much beyond that was discouraged by all the doctors I was seeing back then. I was repeatedly told to except this as my new normal but thankfully there was a part of me that just wouldn’t let this happen and I refused to listen to them. This was less four years ago, yet here I was, ready to ski a marathon distance race. 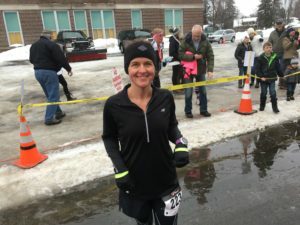 I knew my body was in good enough physical shape for the task, and hoped my conditioning could make up for some of my inexperience and lack of refined technique. 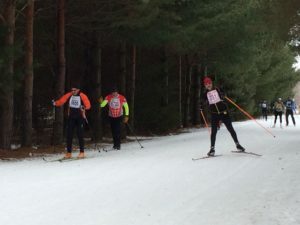 This was my first time around other cross country skiers/racers. Until this point, I had been on skies less than three months in over 30 years. 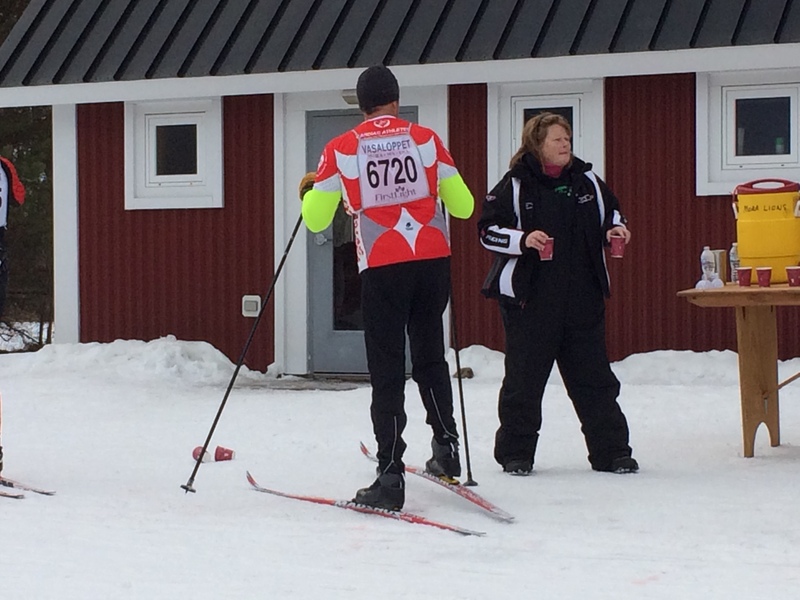 Following is a brief rundown of how I found myself skiing the Mora Vasaloppet Classic 50K. 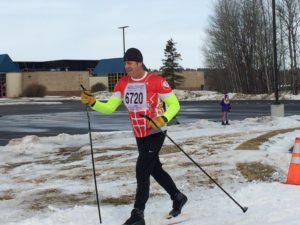 Earlier this winter, tired of being chased inside to my treadmill by wintry Northern Minnesota weather, I decided to break an old promise I had made to myself over 30 years ago, and that was to take up cross country skiing. Thirty years ago, while serving in the US military as a young Paratrooper, I learned to cross country and alpine ski in the Dolomite’s of Northern Italy, under instruction of the 4th Italian Alpini Paracadutisti (Alpini Parachutist) Regiment. For two years in a row while serving in the US army while stationed in Italy, I received advanced instruction in Alpine, Cross country Skiing, Snowshoeing and winter survival. 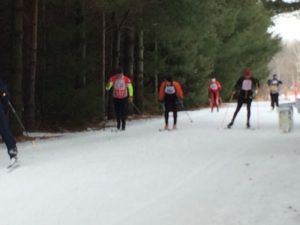 The cross country skiing we did was on these old awkward cross country skis and alpini boots. 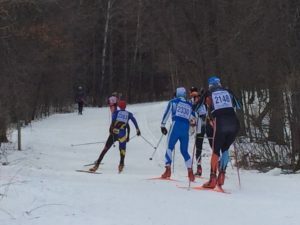 The skis had metal edges, and required a felt climber to be strapped on for traction while going uphill, with a binding that could lock down for downhill travel. 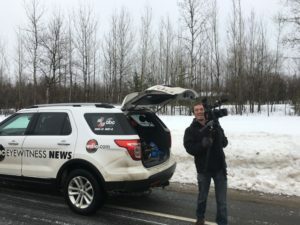 We wore heavy backpacks full of personal gear and carried a weapon, while pulling an ahkio (sled) behind us that contained 100’s of pounds in gear. To pull the sleds, we used harnesses very similar to ones found on dog sleds, allowing 4-6 of us to pull the ahkio at once. 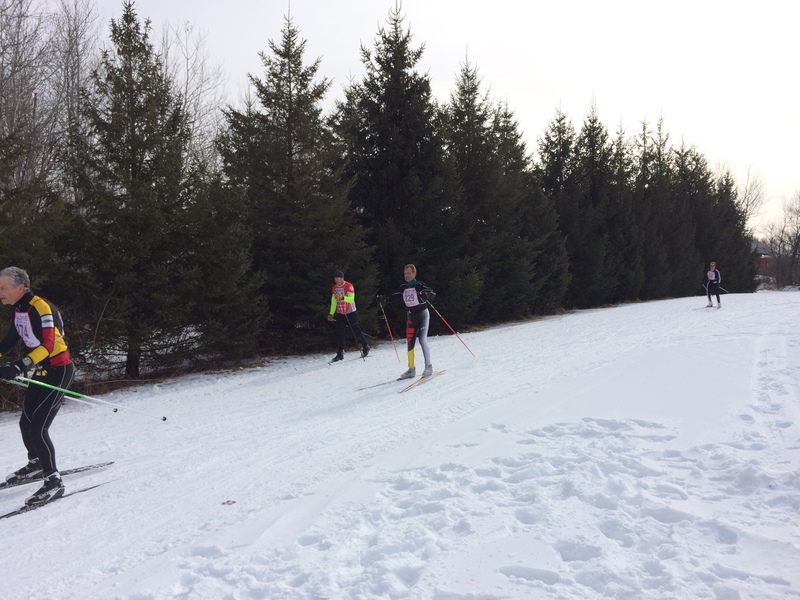 After about 5 days of cross country skiing that basically consisted of climbing up, over, and down one mountain after another while looking for a make-believe enemy, I promised myself I would never put on cross country skis again in this lifetime. The worst blisters of my life came from those cross country Alpini ski boots. I really didn’t see any fun in any of it at the time. It was seriously hard, physically demanding work. Those mountains seemed to go on forever and my blisters only got bigger. None of this necessarily prepared me for a race thirty years after the fact, but did give me a basic understanding of how cross country skies work, and if nothing else, it taught me how to push through the pain, a lesson later used at other times in my life. 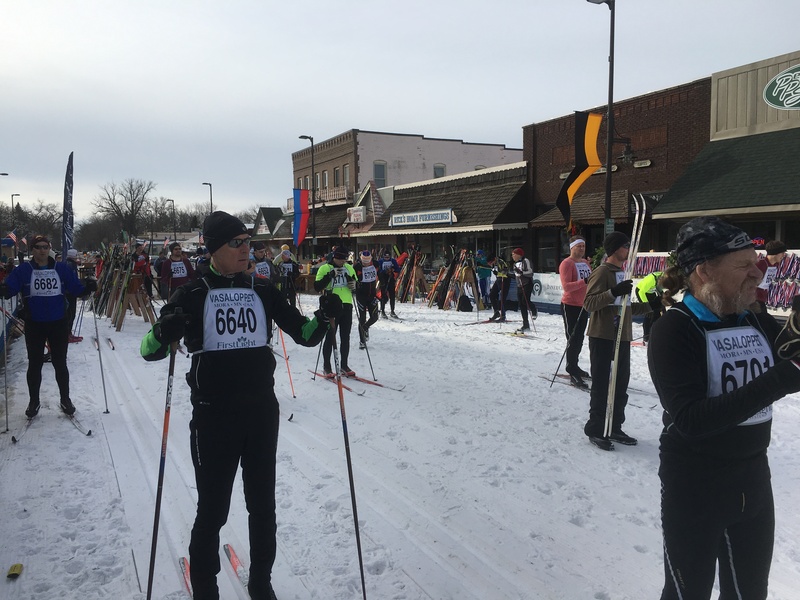 So, last fall I decided it was time to break the promise made to myself so many years before, and I started researching classic cross country skis. 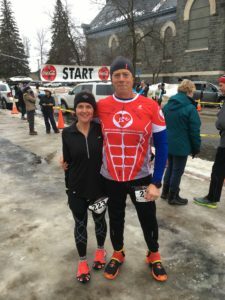 I was looking for something Heidi and I could do in the winter that would help carry and maintain our summer fitness level we had built while running, through to the following spring when we would be able to start running again. 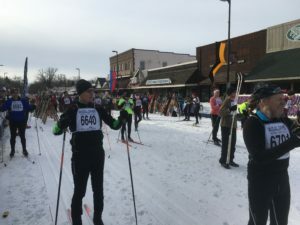 We settled on trying out some wax-less classic touring skis and went to get fitted for them at Pengals Basswood Trading in Ely Minnesota. 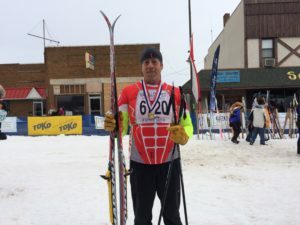 The first thing I learned that process, is that when you are 6’2” and weight in around 210lbs, there will be very few ski options available in Ely Minnesota. Apparently, the average person buying skis weights 20 or more pounds less them me. Thankfully they had one pair that was a borderline fit. Heidi is much smaller than me, and they had many options for her, quickly producing a pair that fit her very well. 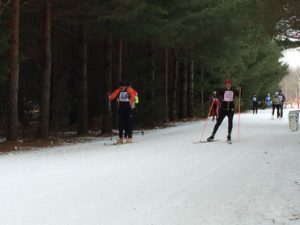 Another reason I decided to break my promise and was taking up cross country skiing was to take advantage of many of the 1000’s of groomed cross country ski trails here in Northern Minnesota. Cross country ski trails are everywhere in our area. 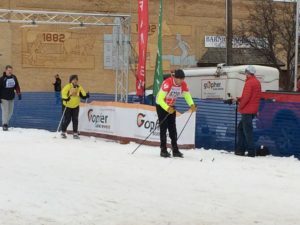 Almost every town here on the Iron Range has a trail maintained specifically for cross country skiing. 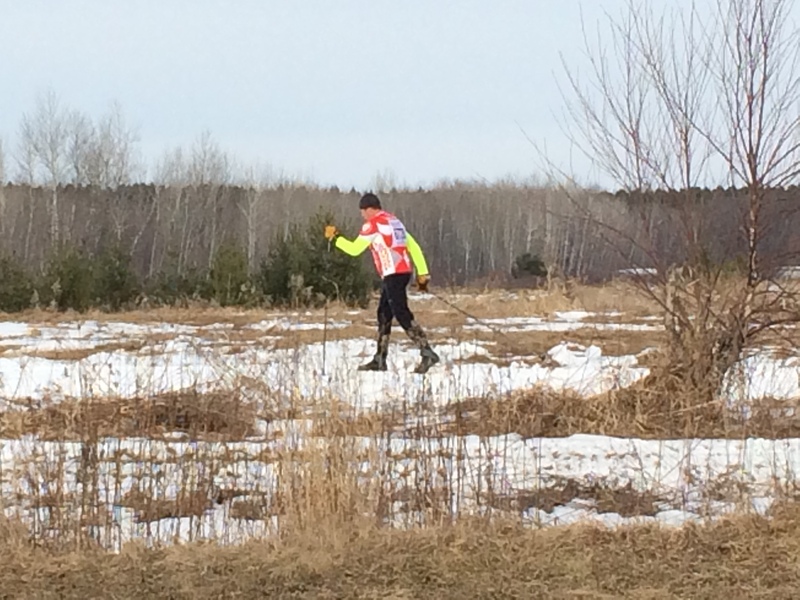 In Minnesota, once winter gets into full swing, it gets hard to run or bike because all the trails generally have a couple feet of snow covering them. 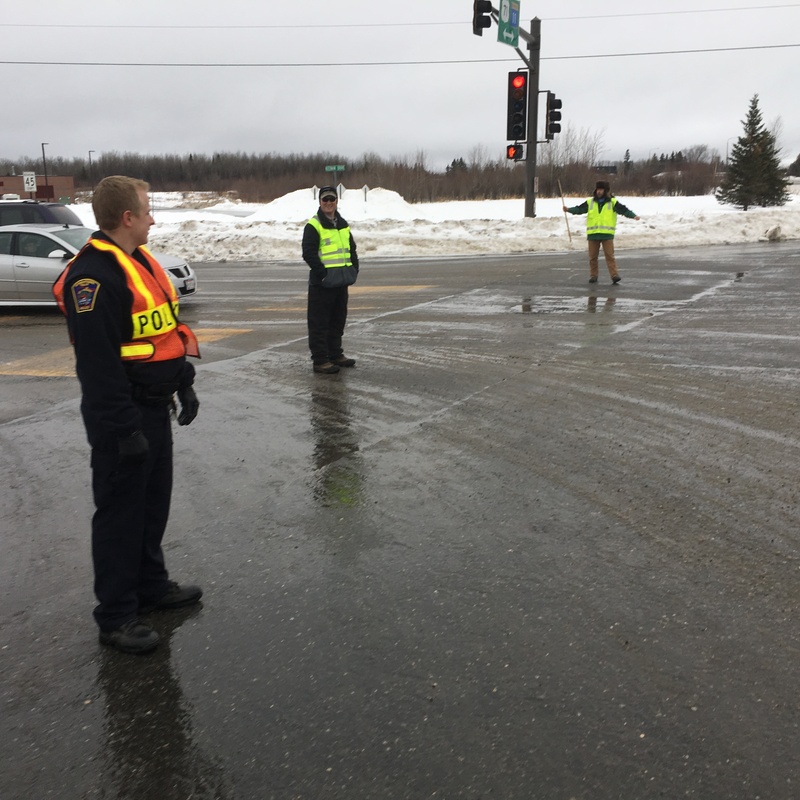 All the highways and roads become dangerous to run on once the snow piles up leaving very little shoulder for pedestrians. This left the treadmill in the garage as our best option for getting in some cardio during previous winters. I really thought skiing through the winter versus spending it running on a treadmill staring at the inside wall of a garage all winter might be a better option for getting some cardio in. Once we had our skis, we were super excited to try them out but unfortunately for us the weather wasn’t cooperating and none of the trails were tracked/groomed. Our first few outings, were on the Babbitt golf course and consisted of breaking our own trail around the outer edge of the property. 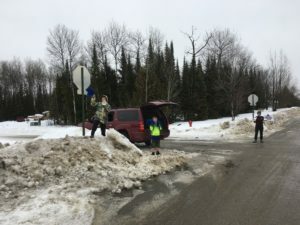 We did this for almost a month before the trails were finally being regularly groomed. Once the grooming started, we began skiing loops on the golf course almost every night during the week while venturing off and discovering new ski areas on weekends. It didn’t take long to realize the potential in speed I would have on faster skis. 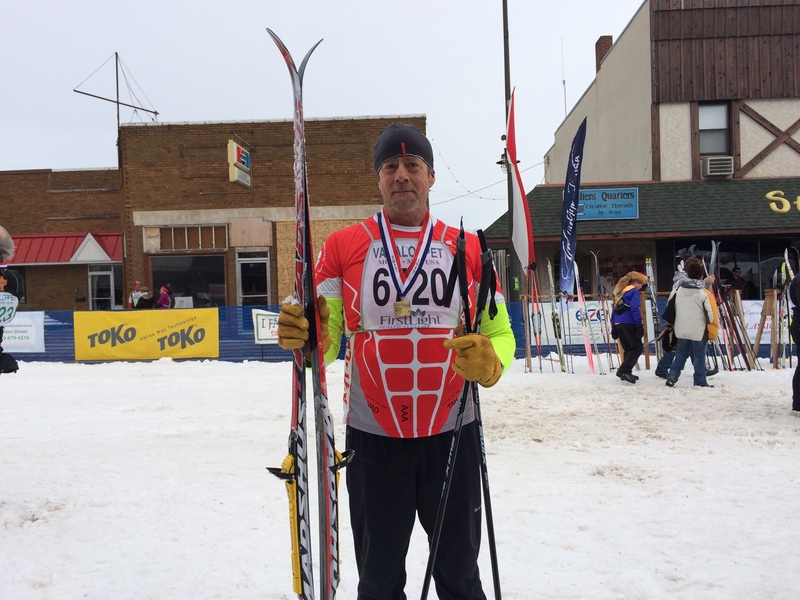 My skis were very slow because they were wax-less touring skis designed for someone 10 or more pounds lighter than me. My frustration continued to grow as I watched others pass me with ease, and this resulted in a lot of glide wax experiments trying to make them faster. 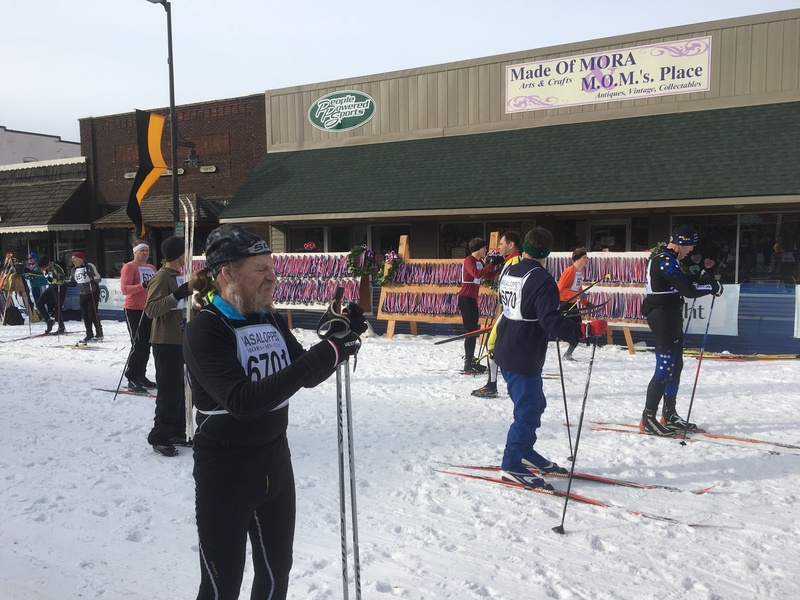 But nothing would make them any faster, so I went back to Pengals Basswood Trading in Ely and bought a pair of wax-able race skis. This time, I was fitted with a nice, stiff ski that appeared to be a perfect fit for my weight. I was given a short lesson on waxing the kick pocket before heading out the door to try them. I couldn’t have been happier after trying them out. The glide was almost double that of my wax-less skis. For the first time in my life, I now understood the attraction to cross country skiing. Putting on a pair racing skis was life changing. Nothing that soothes the soul and erases life’s stress the way quietly and quickly gliding through the woods on a gorgeous sunny winter day can. I woke up most mornings excited to go skiing when the conditions were nice. For the first time in many years, the cold seemed to melt away, and I found myself enjoying winter again. It took a little time to learn how to choose and apply the many variations of kick wax. I ended up with a box full of different waxes for different conditions. but the pay off in speed was well worth the lesson. 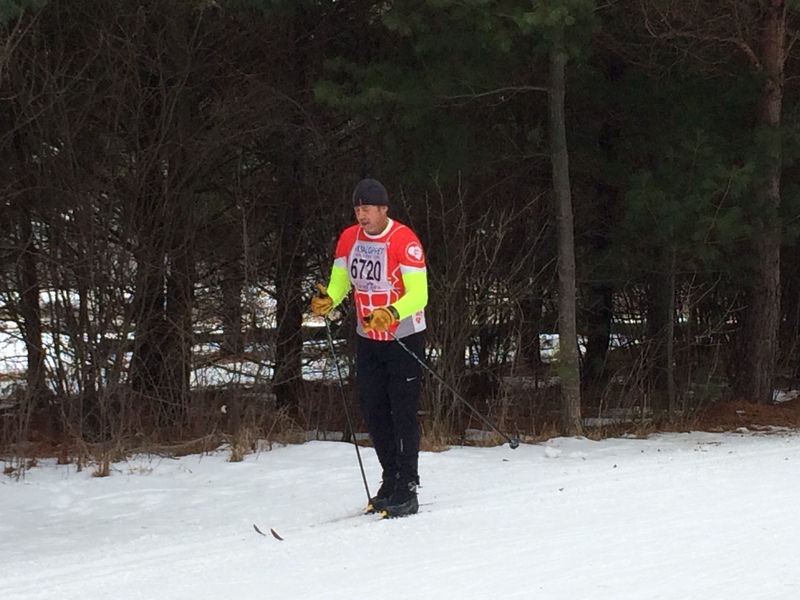 At this point, I was averaging the same pace on my skis that I normally run at while on flat ground or going uphill. The downhill sections I was going much faster than any pace I can run at. By now, all the trails I was skiing were groomed and tracked. For the most part, I was skiing on fast pristine conditions most days and could ski 20 miles very easily without much effort. One night while relaxing for the evening, I came across an advertisement on the internet for the Mora Minnesota, Vasaloppet. 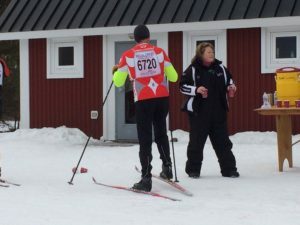 The Vasaloppet is a 50K classic ski race that would be held the following weekend. I didn’t think about it but for maybe ten minutes, before deciding to enter the race. I was nervous and excited all at the same time. A marathon on skis was something I wouldn’t have even been capable of just a year before, and at this point I knew I could finish without any trouble. The following week was full of research on proper kick wax and glide wax for the expected weather conditions. 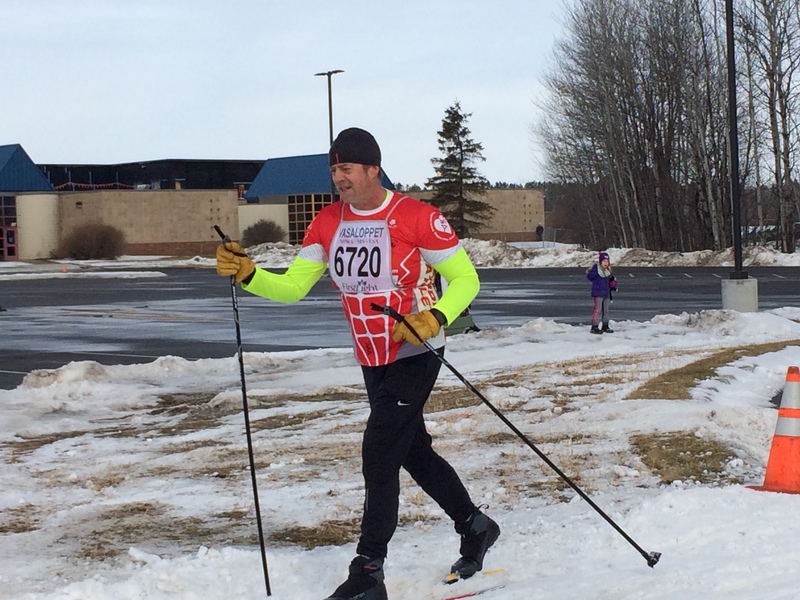 I took my skis to Mesabi Recreation in Virginia, Minnesota and had the proper glide wax for conditions applied. I had to go to three different shops however to find the Klister wax(s) needed for kick. Weather conditions were going to be unseasonably warm with temps in the lower 40’s requiring a special wax combination. 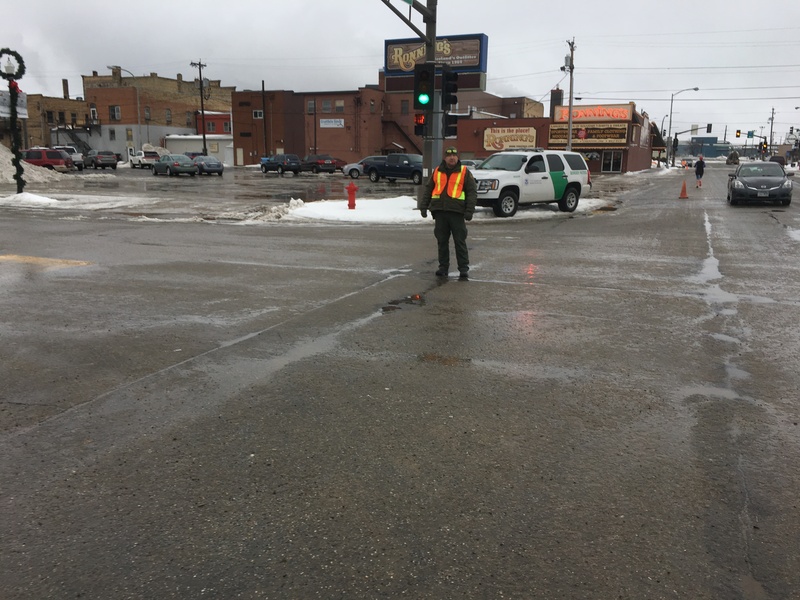 I settled on a hydrocarbon glide wax, and a three layer Klister kick wax combination with the help and recommendation of Mesabi Recreation. The town of Mora, Minnesota host’s this annual ski race every year. The race begins and finishes on main street. With a fleet of dump trucks and heavy equipment, snow is trucked in until it completely covers main street. 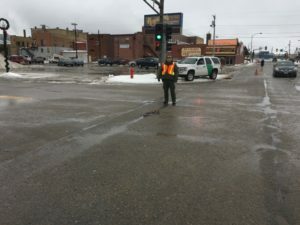 In places where the trail crossed the roads, snow was also trucked in and dumped across the road. 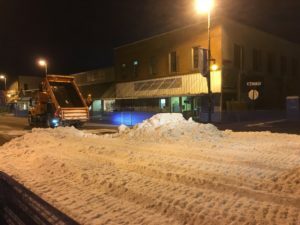 It was an amazing amount of snow to haul and spread out. 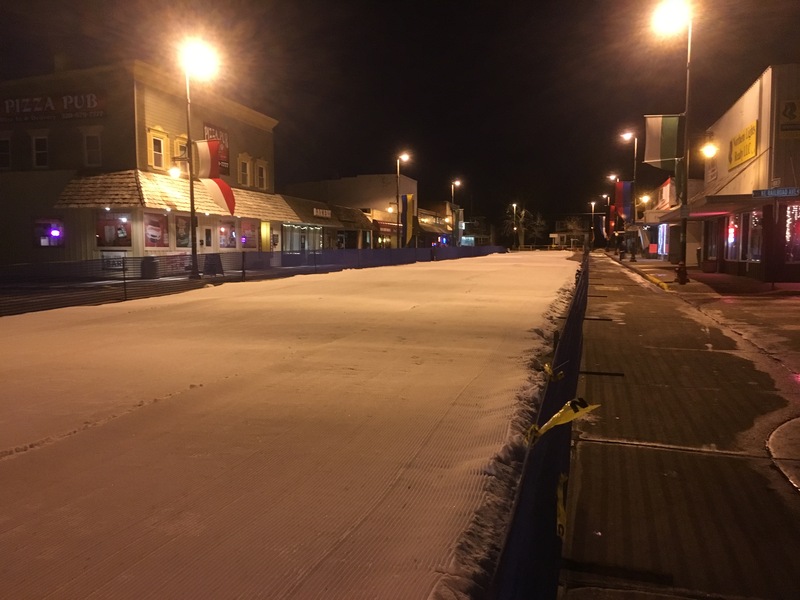 As we pulled into town the night before the race, I was absolutely amazed at how little snow there was on the ground. The lack of snow on the ground started making me doubt they would even have a race but upon getting to the registration we were informed the trails would be good, but that due to the lack of snow, the 50K was now going to be 42K. This was somewhat disappointing because I had come to conquer a 50K ultra-marathon on skis. I signed up for the race and then Heidi and I walked across the street and attended the pasta dinner that was being served for the event at the American Legion. After dinner, we retired to our room at the American Inn where I did my best to get some sleep, however I tossed and turned most of the night, becoming more nervous as morning drew near. Morning arrived and brought perfect conditions for skiing. It was about 30 degrees at the start so conditions would be fast. After about a 20 minute wait in line for the porta john, I headed to the start line, picking a spot somewhere in the middle of the pack. 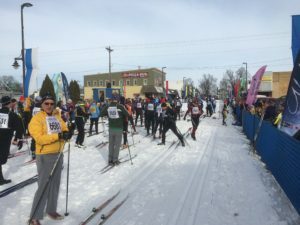 while finding my way to the middle of the pack, it quickly became obvious seeing all the brightly colored spandex cladded people with super human size legs around me that hanging with these guys would be by far the hardest and fastest I have ever pushed on a pair of skis. The more I looked around the more I started thinking of how tiny my legs looked in comparison to everyone around me. They looked really fast in those shiny spandex suits. 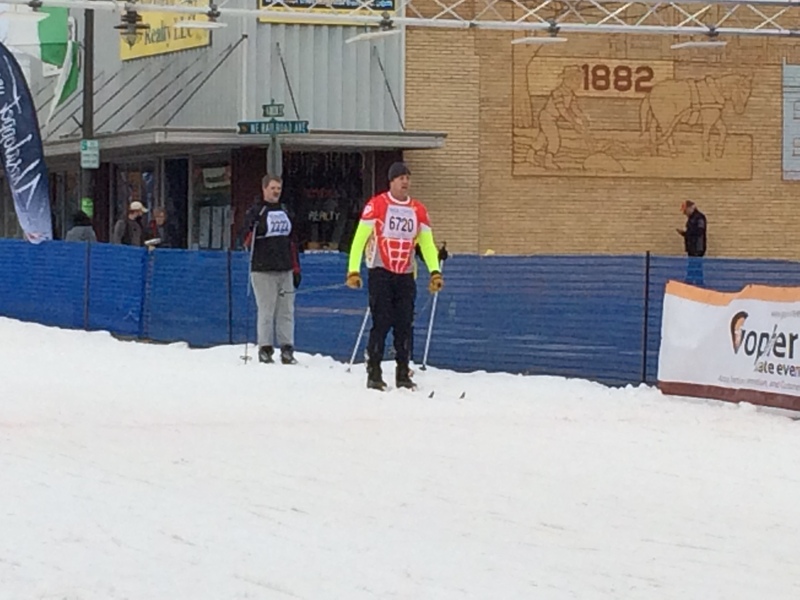 From what I could see, I was probably the only guy not wearing a bright spandex ski suit, and the guy with the smallest legs. It was intimidating being in that start que for the first time ever. No doubt, I felt like I was about to get schooled on the fine art of classic skiing. Thankfully I was able to get my intimidating thoughts under control and remind myself I was there to compete with the guy I was yesterday, and to learn from the Pro’s. Since the guy I was yesterday didn’t ski, I had already won just by showing up. And just like that we were off. 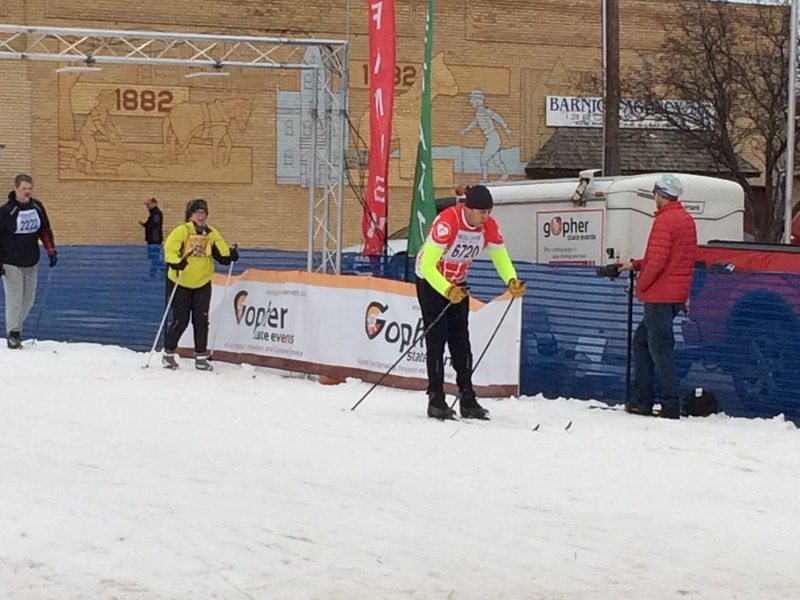 With a loud bang from the start gun it became a flurry of poles and skis. 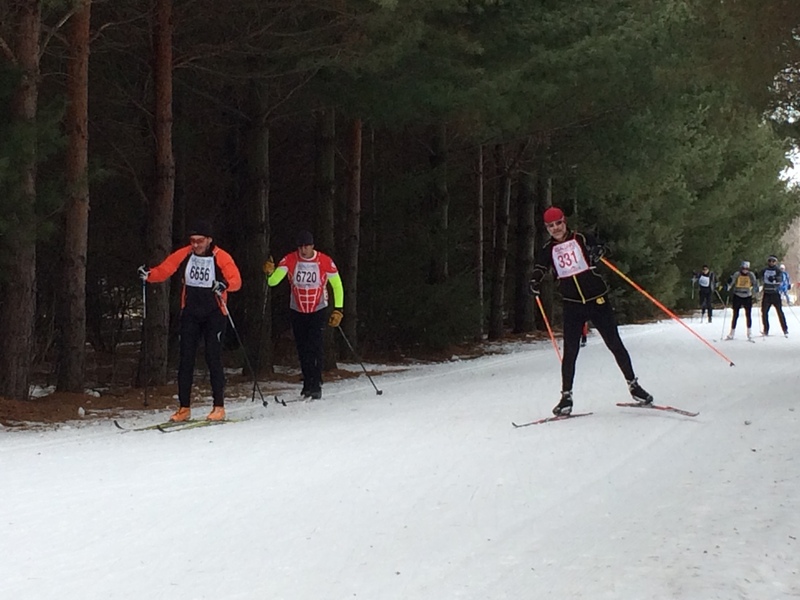 For whatever reason, I had never pictured the start of a race on skis. Being more of an optimist, I generally think about the finish line. Turns out, the start of the race was pretty intense. 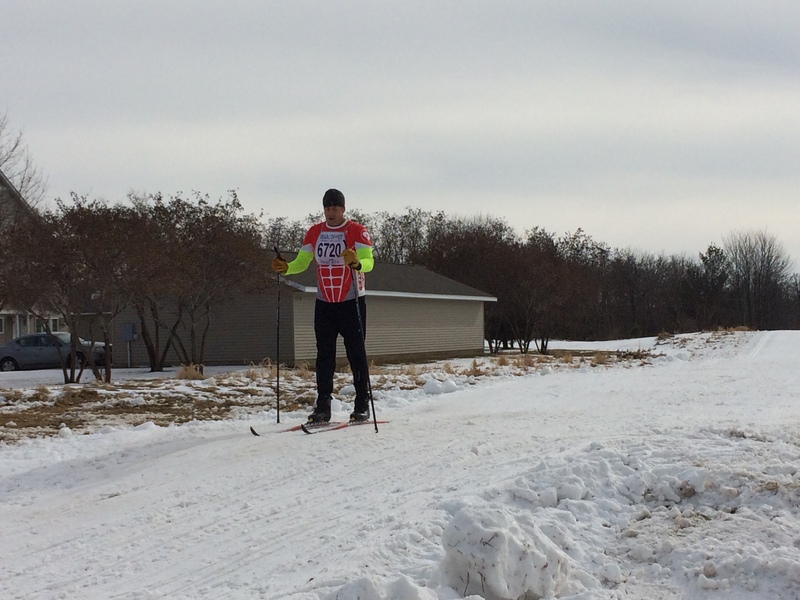 I had people running their skis up on the back of my skis, pushing me up on other people’s skies. I lost count of how many times I was hit by other people poles, or hit others with my mine. 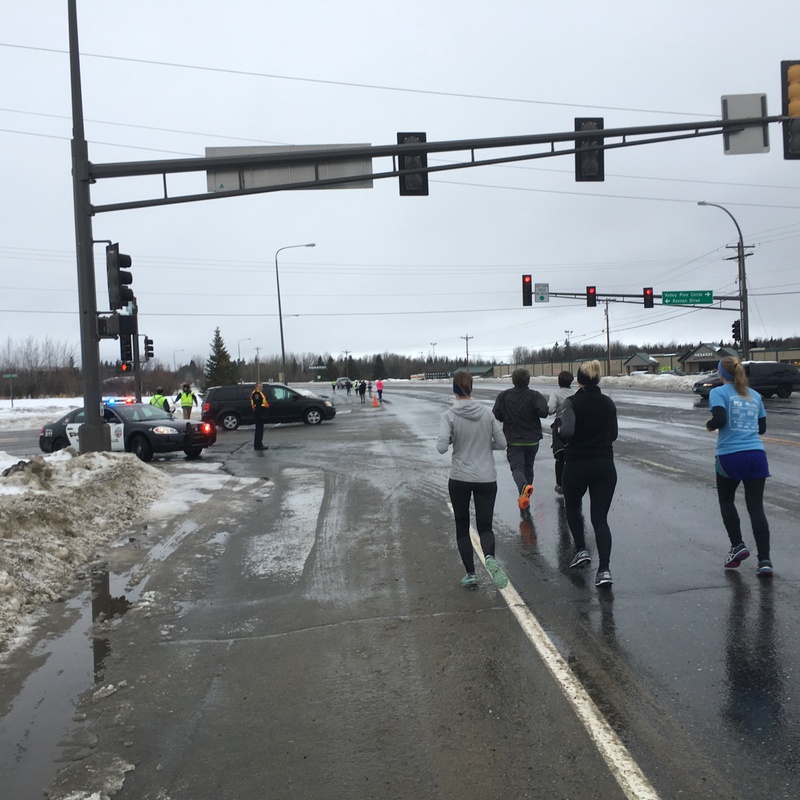 For the first mile I kept thinking that If I crashed and went down the people behind me would run right over me. Everyone was headed forward as fast as they could go. After taking a painful jab to my foot from someones pole, I did my best to just tuned it all out and push forward. At that point, I was concentrating on keeping my ski tips about six inches off the skis of the guy in front of me. For the first mile or so, the pack seemed to stay really tight before finally loosening up and spreading out somewhat. The snow conditions were really fast. My wax was working out perfect at this point. The glide on my skis was incredible and the kick was just as incredible as the glide. 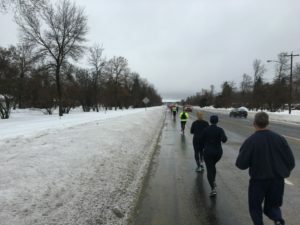 I was hanging with the middle of the pack in these conditions with ease, and felt like I could easily hold the pace for the next 50K. After a few miles, we came to the first hill. It wasn’t very high, but it was steep. I had no trouble running up the hill. I was amazed at how well my kick wax was working. 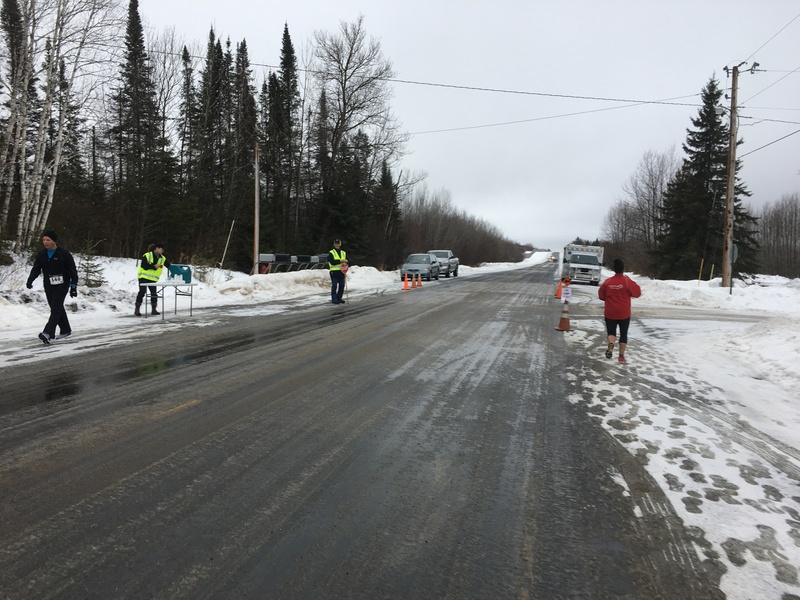 I was able to diagonal stride most of the hill, and had no issues running in a herringbone pattern on the steepest portion before turning onto a short level portion leading to a very steep descent with a slight turn at the bottom. As I approached the turn at the bottom of the hill I knew I quickly realized I was in trouble. I did my best to make the corner but ended up out in the woods. I took a good tumble but thankfully not injured and was able to pick myself up and quickly push on. After I had gone about 10 miles or so, the conditions started to get really soft and I kept running into issues on the downhill sections. It was pretty obvious that I needed to practice more downhill trails to learn how to control classic cross country skis during a steep descent. They handle nothing like a metal edge ski on downhill and my inexperience was showing. About half way into the race I was still holding middle of pack right up to the point where I wiped out myself and two others on a steep downhill section. One of my poles went flying pretty far, and it took me a few minutes to pick myself up and find the pole before pushing on. I had taken a pretty hard hit, actually knocking over the guy that was in my way. At this point was really starting to dread the downhill sections. Thankfully there were not a lot of these steep hills, but just enough to show me my biggest weak spot. 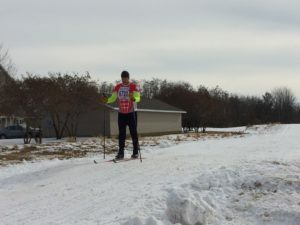 At that point, I promised myself I would ski more downhill sections in training until I master turning on classic skis. Saturday morning found me wide awake at 4 a.m., thinking about a race. So many things going through my mind, with my heart being at the top of the list. Sometimes I get a little hung up over the logistical issues in cold weather like what shoes I should bring, how many layers of clothing I should wear, ect. But it doesn’t end there for me because I also need to look out for my wounded heart. 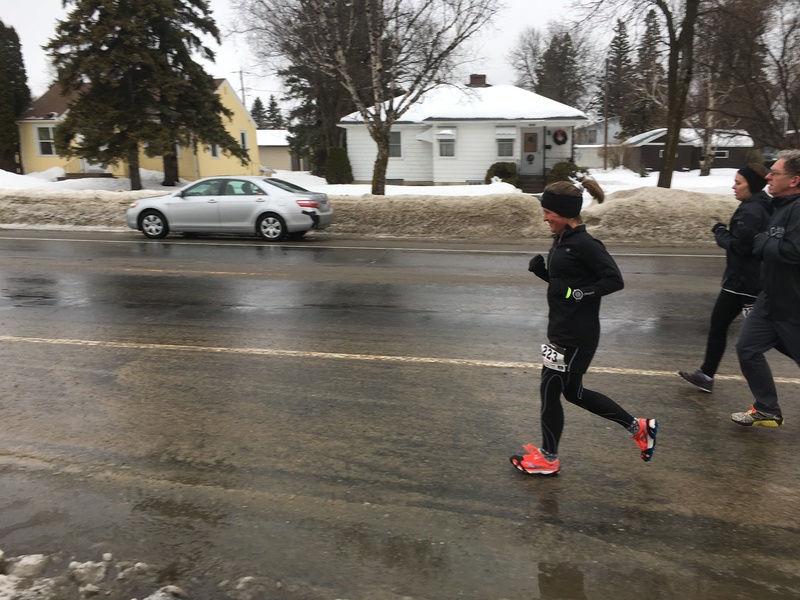 I took up running to help strengthen the heart, not weaken it, and I believe there is a balance that must be met to keep everything on the healthy side. As a competitive person by nature, I love the adrenaline rush experienced in a race more than the competition itself. Most of my life I’ve been chasing that rush. 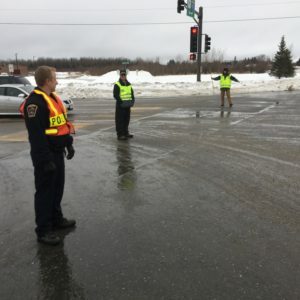 Whether I’m riding a snowmobile, motorcycle, driving a fast car, or a pair of running shoes, my apparent need for speed is nothing more than a craving for adrenaline. 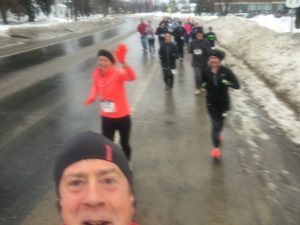 Since I started running only four years ago, I have discovered running has the same exact adrenaline producing effect on me as racing motorcycles and snowmobiles. No doubt about it, I am an adrenaline junky and love the added kick I get from a dose of adrenaline. Over the years, I have enjoyed various motorsports. I lost count a long time ago of how many snowmobile motors, dirt bikes motors, boat motors, and car motors, that blew up while I was using them to race someone or something. 99 percent of those motors usually died prematurely for one or three reasons. Exceeding the red-line, improper warm up, or a combination of both. The only injuries I have suffered from running are muscle injury’s that occurred because I skipped warming up and pegged my heart rate to the red-line right out of the gate. As most people who exercise hard, or who play sports already know, one of the fastest ways to take out a muscle is to work it work it too hard before allowing the body to warm up. 8 years of living with heart failure has taught me to view my heart much the same way as I view a high-performance motor. Both need an adequate warm up period before they will function properly. When doing anaerobic work such as racing in a 5k or a 10K, warming up is not only easier on the heart, it also results in a faster time. 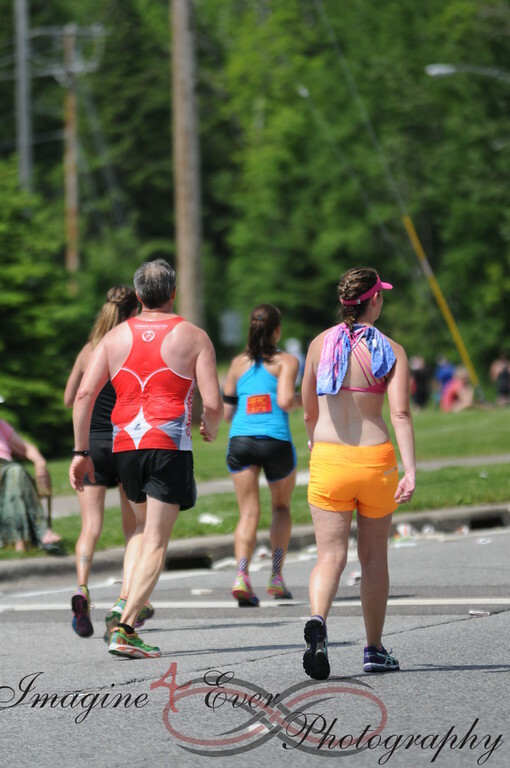 There are many physiological responses that take place in the body during as we start running. Warming up properly, enables many of these Reponses to take place while the body is still in its aerobic zone. This results in a lower sustained heart rate once we are in the anaerobic zone. More importantly and to the point, warming up slowly places significantly less stress/strain on the heart. 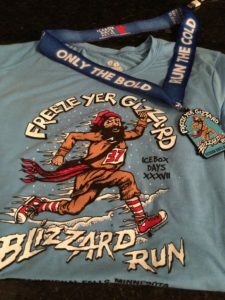 After a couple years running exclusively with a heart rate monitor, I learned that my heart rate runs 10-15 bpm faster during cold weather (like the weather at freeze your gizzard blizzard 10K). I have also learned through trial and error, that skipping the warm up for a 5k or a 10k, even during warm weather, significantly lowers my finish times while producing a higher average heart rate and a slower recovery. Cold weather significantly exasperates these issues since my heart isn’t pumping at full capacity. Warming up before a race can be difficult during a northern Minnesota winter. 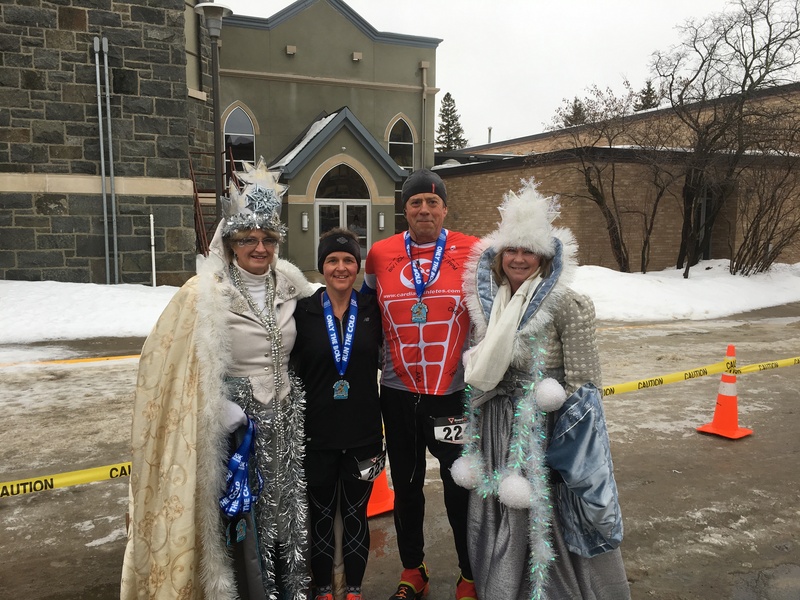 Standing in the corral at the start line can be a chilling experience when your dressed in light running attire and the temperature is below freezing with snow on the ground. For me, to even think of a new 10K personal record, I need to run the first mile only a few seconds slower than the last mile. This means that I must start the race at a pace that places me well into my anaerobic zone right from the start. So after laying awake in bed thinking about all this stuff for half the night before the “Freeze Your Gizzard Blizzard 10K” I decided to skip the racing altogether and to just run for fun with my wife who races at a pace that’s 3-4 minutes per mile slower then mine. Although I did miss feeling that adrenaline kick, I had a blast. Running slower allowed me to relax and just have fun while taking it all in. 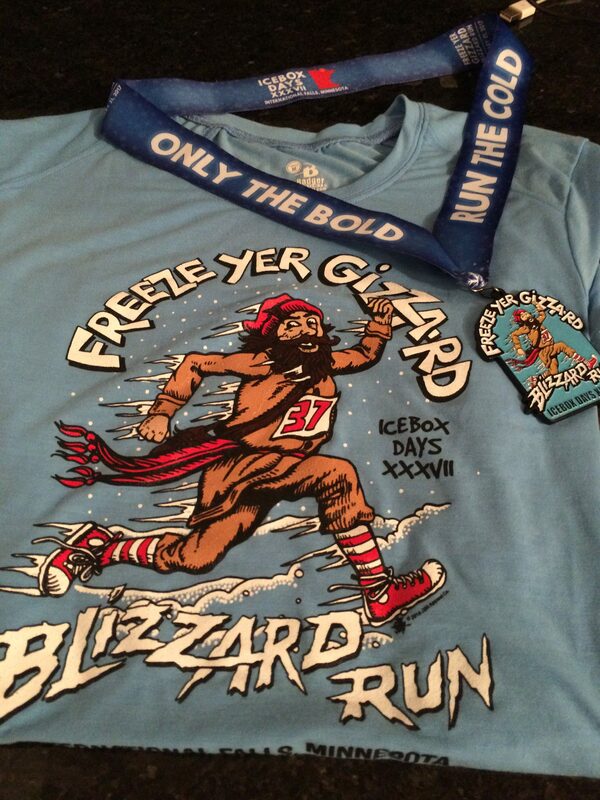 I plan on running more races just for fun in the future. 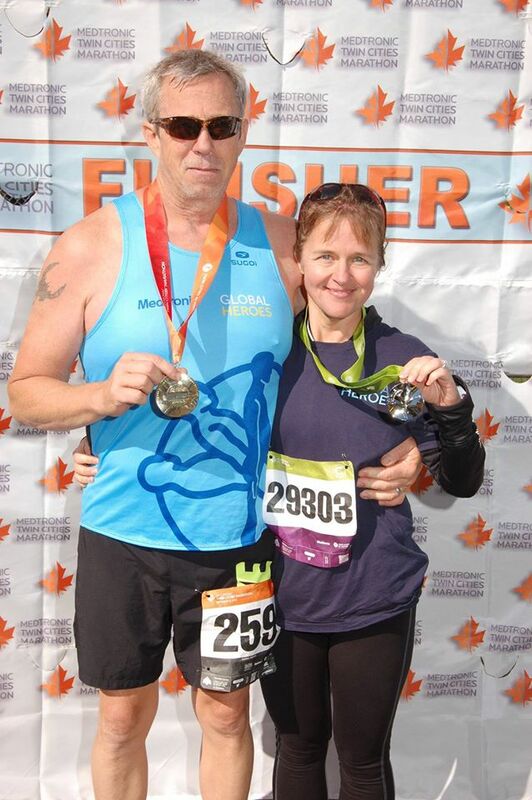 No pressure, no stress, just an enjoyable time running with my wife and hundreds of other people. It really was a great time. 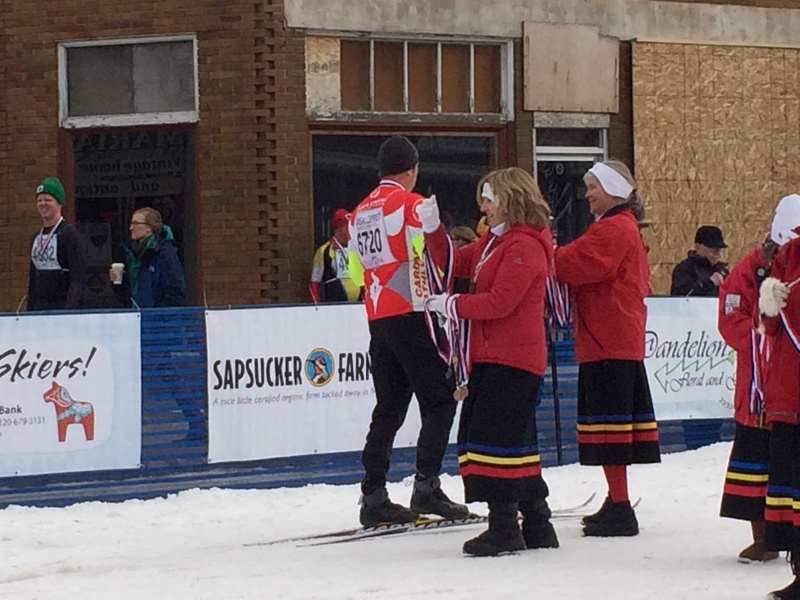 The City of International Falls did an awesome job of hosting this race and I was really surprised at how well everything was set up. Lots of small town charm and that friendly charm I would expect from a small town in the border country of Minnesota. 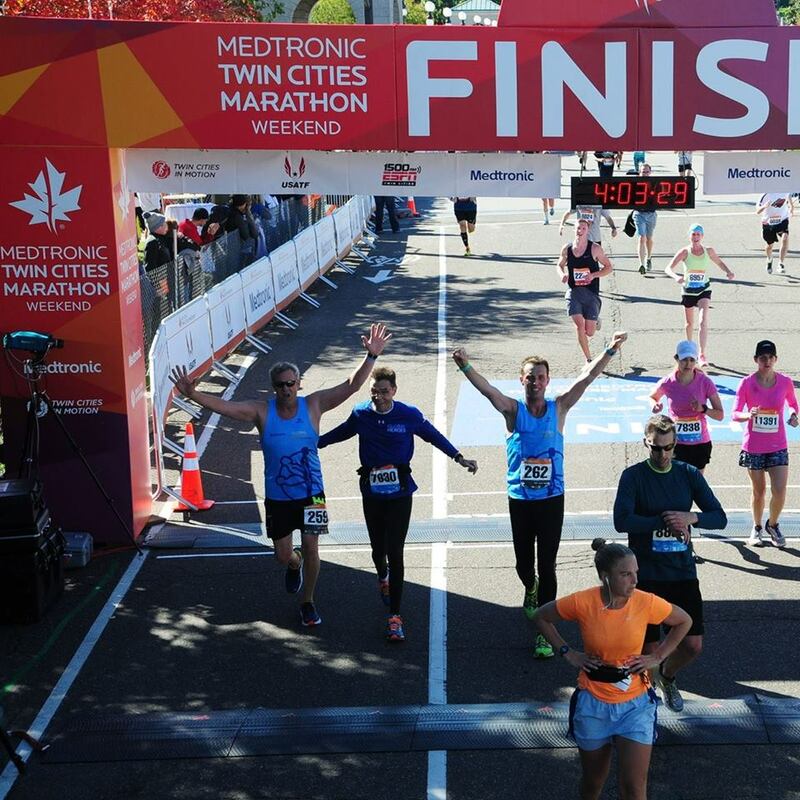 Last June I was one of 26 people selected by Medtronic to attend an all-inclusive weekend for two which included an entry into the Twin Cities Medtronic Marathon for me and entry into the TC10 for my wife. We flew to Minneapolis on Thursday afternoon where we were greeted by people holding signs with our names at the airport and chauffeured to our hotel where we were basically waited on hand and foot by our unbelievably gracious hosts for the next few days. When we first arrived at the airport I was pretty focused on the race and nervous, despite the fact I really had nothing to be nervous about …except my own disappointment if I failed to get the sub4 finish goal I set for myself. Thankfully we had a super busy itinerary that included activities ranging from dinner banquets and an awards ceremony, to a tour of the Medtronic building with the opportunity to meet some of the scientists responsible for the lifesaving technology in my Pacemaker/Defibrillator so I really didn’t have much time to worry. The weekend turned out to be way more than just a race. It was more a celebration of life than a celebration about a race. 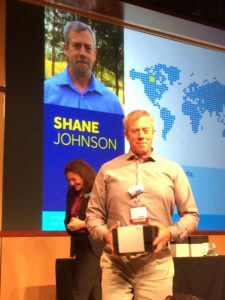 The more I listened to stories of the other Global Heroes, the more amazing my weekend became. Everyone’s story touched me deeply. Their tales were full of love, courage, and determination. 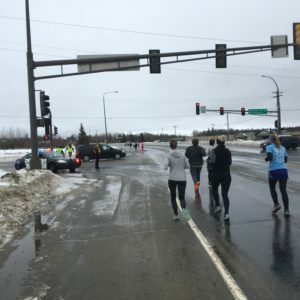 Everyone selected to participate in this race had a variety of medical diagnosis that would have permanently sidelined most people yet they had flown in from all parts of the globe to show the world life doesn’t end with a medical diagnosis. Despite very challenging health issues these individuals were wholeheartedly embracing their second chance at life and believed in living to it to the fullest. 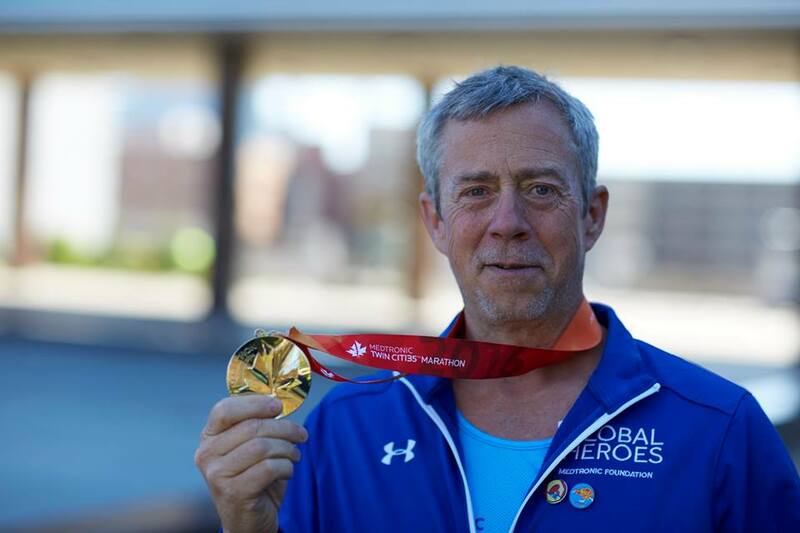 The lifesaving technologies used by these individuals, coupled their with unwavering iron will(s), courageous determination, and a strong love of life has allowed them to continue to race while inspiring many others along the way. Each person’s race began on a course filled with medical diagnosis obstacles but was won the day their feet touched the starting line. 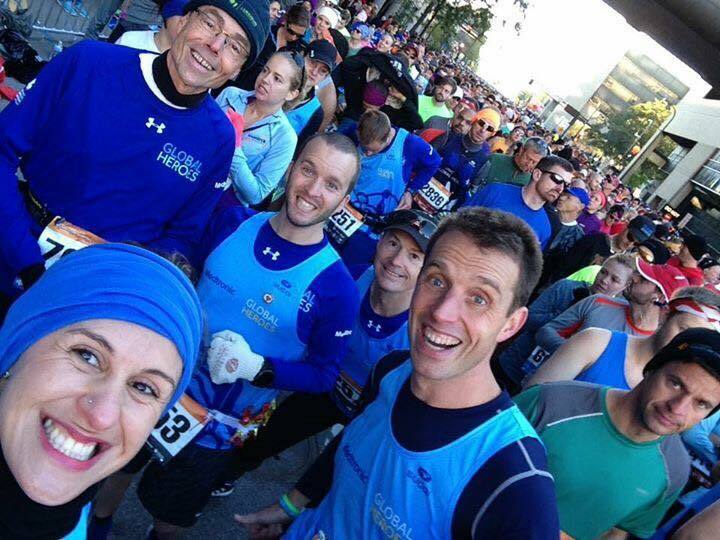 They race to give others hope and each of their personal stories is nothing short of amazing. Despite unpleasant, and in many cases very painful circumstances, these people are all not only still smiling, they are living life with a passion. I will forever be inspired by each one of their stories and so honored I was able share this special weekend as one of them. 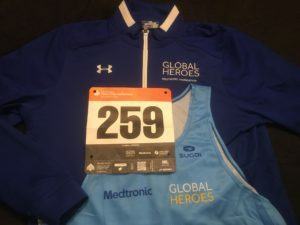 When I first read about the Medtronic Global Heroes Program early last winter, I immediately rushed to get my application in. 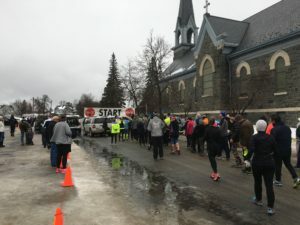 The application process seemed straight forward and easy enough to navigate through but I did get a little hung up while reading the rules when I came to the part stating you must have successfully completed a Marathon prior to applying. I had yet to run in any race beyond a half marathon and had never run a distance beyond 15 miles even in training however I was confident I could conquer the 26.2 mile Grandmas Marathon in the spring. Crossing my fingers, I submitted the application hoping Medtronic didn’t process it prior to my finish at Grandmas. I was banking on being able to use my official time from Grandmas marathon to qualify me to run in the Medtronic Twin City’s Marathon as a Global Hero because the TC10 option just didn’t hold the same appeal for me. 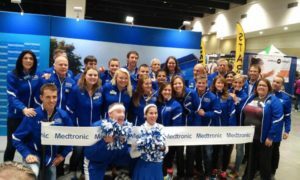 I was notified by Medtronic less than a week before Grandma’s Marathon to inform me I had been selected. 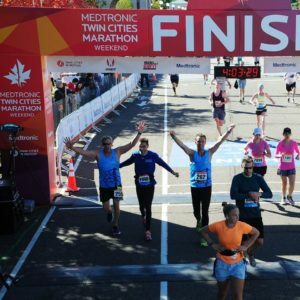 I wanted to run fast enough at the Twin Cities Medtronic Marathon for a sub4 finish. No handicap of any kind, just 26.2 miles of pavement as fast as my body would carry me. I wanted to show others suffering from heart disease that so much more is possible then most have been led to believe. I wanted to show the world that heart failure/disease is just a diagnosis that need not stop the race. The typical societal labeling that normally associates Cardiac Patients as fragile and weak need not apply in this miraculous age of medical technologies. Race day arrived and I barely slept a wink the night before. My best guess is I maybe got 4 hours of sleep, which is a far cry from my normal 8-10 hours of sleep. I was excited but was also nervous. 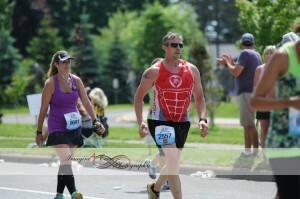 I knew if I went out too fast I would crash and burn long before the finish line and my tendency to do this worried me. 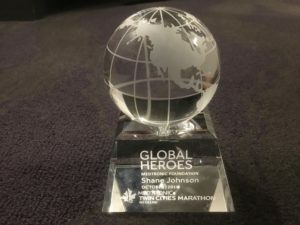 Thankfully some of the other Global Heroes were planning to run the same pace as me with the same goal of a sub4 finish. 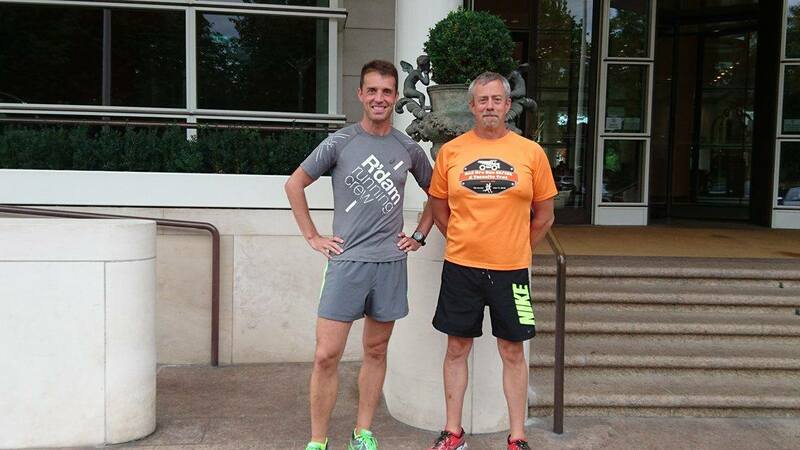 One of the Heroes, Jeroen Hoorn from the Netherlands, was accompanied by his father Leo Hoorn. 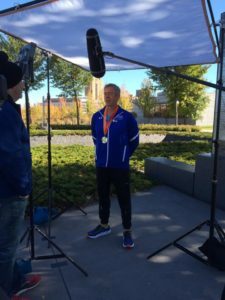 Leo is an accomplished marathon runner and normally runs much faster having a PR of 2:56 and over 33 marathons to his credit. Leo was gracious enough run slower in this race just to help pace us to a sub4 finish. I will always be super grateful for Leo’s help. Without it, I most likely would have crashed and burned somewhere in those hills that seemed to never end. I actually met Jaroen only weeks before while I was in the Netherlands. 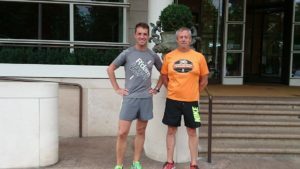 The picture below was taken at my hotel in Amsterdam posing with Jeroen about four weeks before we met again in Minnesota for the race. The first 18 miles or so of the race was absolutely amazing. Energy seemed to be everywhere including in my legs. The energy emanating from the crowds was intense. I had never experienced anything like this. People were lining both sides of the streets cheering loudly. My legs felt fresher then they had in over three months. All my training seemed to be paying off. 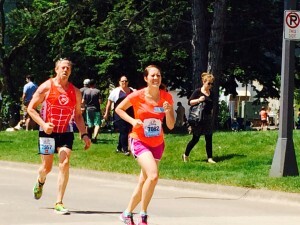 For more than half the race I felt like I could have sprinted to the finish. Thankfully Leo kept reminding me to slow down when my pace would start creeping up faster. 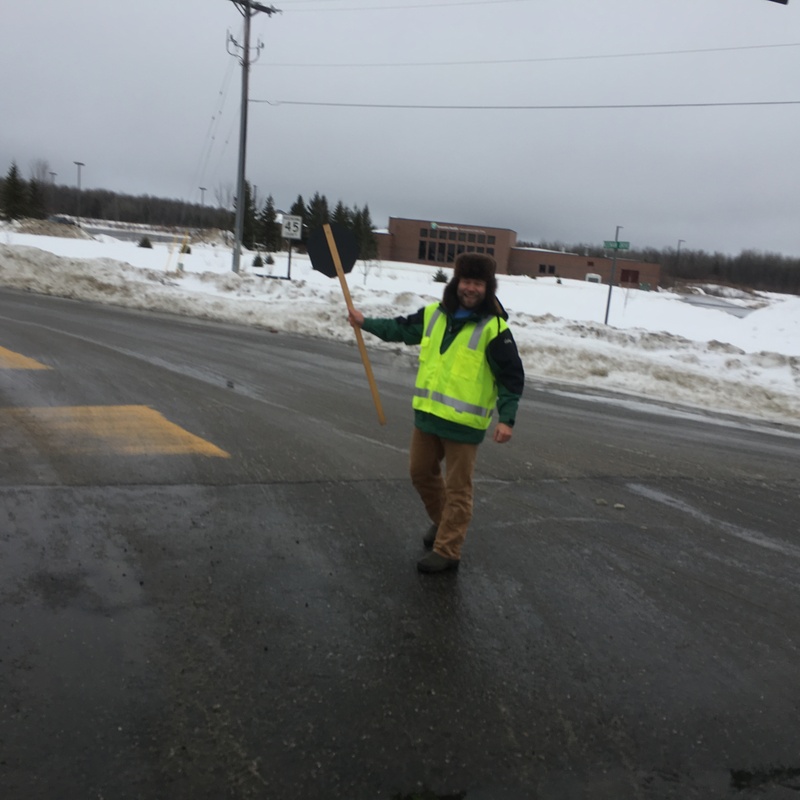 His steady pacing skills along with all the encouragement he kept handing out was invaluable. I was completely caught up in the moment and loving everything about it for the first 15-18 miles but then we started into the hills and it was a quick jolt back to reality but with lots of encouragement from Leo, I managed to stick with a steady pace. 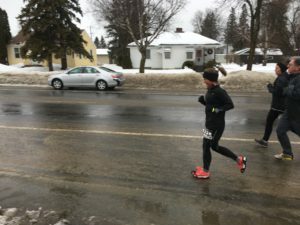 I concentrated on trying to stay relaxed while lifting, not dragging my feet and focused on taking shorter, faster strides going uphill but eventually I couldn’t ignore the fatigue in my legs. 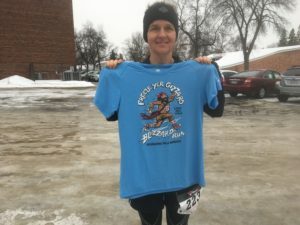 The elated feeling of being able to run forever I experienced throughout the first half quickly faded to a faint memory. In the beginning the smaller hills seemed easy enough but by mile 22 or so they felt completely out of hand. Every time we came over the rise of a hill, another would appear in front of us. As we continued heading up Summit Avenue my pace dropped 15-20 seconds or more and my leg muscles felt as if they were on fire. I had heard and read a few stories of people who underestimated the hills in this race and failed because of it so I was now wondering if I too had underestimated my ability to maintain the pace. Every hill seemed to be higher and steeper than the last. My brain seemed to do me a favor and shut down; I was no longer seeing the crowds or thinking about how much fun we were having. I became so inwardly focused that I all thoughts of my surroundings disappeared yet doubts of my ability to finish crept in. I pushed myself with all the strength I could find, digging really deep in the process; my body now in a complete state of physical protest. Each step seemed to hurt a little more than the last. I became consciously aware of each step and just did my best to stay focused on taking the next. Finally, we crested over the last hill and I could see the end. The finish line arch and cheering spectators were only about a ¼ mile or so down the hill. The Minnesota State Capitol building loomed in the background and created a very surreal backdrop for it all. As we closed in on the finish line Leo was still right there with us but now he was telling us to run faster. Between the large cheering crowd, Leo’s encouragement and the help of gravity going down a hill for the first time in about five miles, I was able to pick the pace back up as I crossed the finish line. I immediately gave Leo a big hug. I would not have got a sub4 finish without his help. 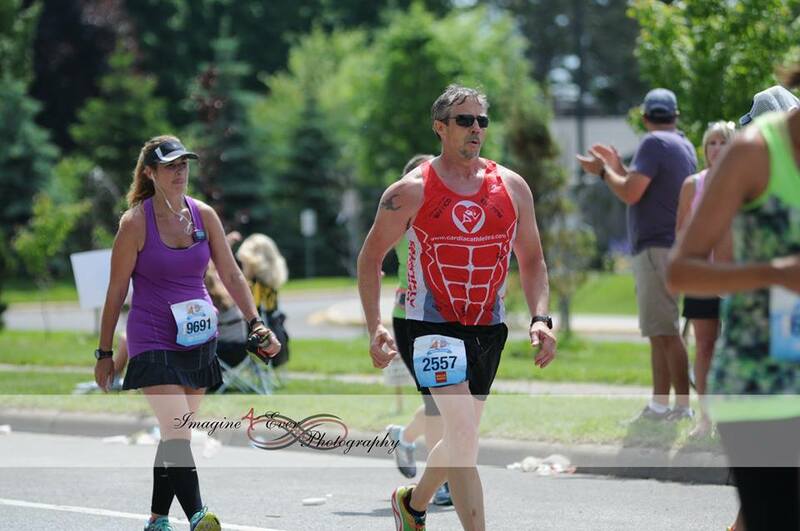 The last miles of the race were humbling and made this point more than obvious to me. In the future, it will serve as a lesson to trust my training and stick to the plan; never start out too fast. As I slowed to a walk after crossing the finish line, something knocked the wind out of me and it was probably 4-5 minutes before I was able to catch my breath and during that time, I shed a couple tears; the emotions were so overwhelming. This had been about more just than a race to me and I felt as though I had WON it by a huge margin. After all, I was racing the guy I was yesterday and he never stood a chance. Not even close. 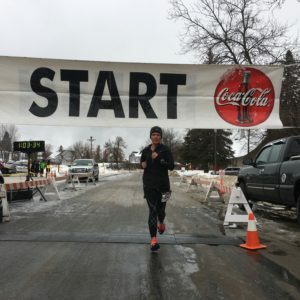 This race was the culmination of a commitment I had made to take back my health and my heart and that morning, when my feet hit the starting line, I won. 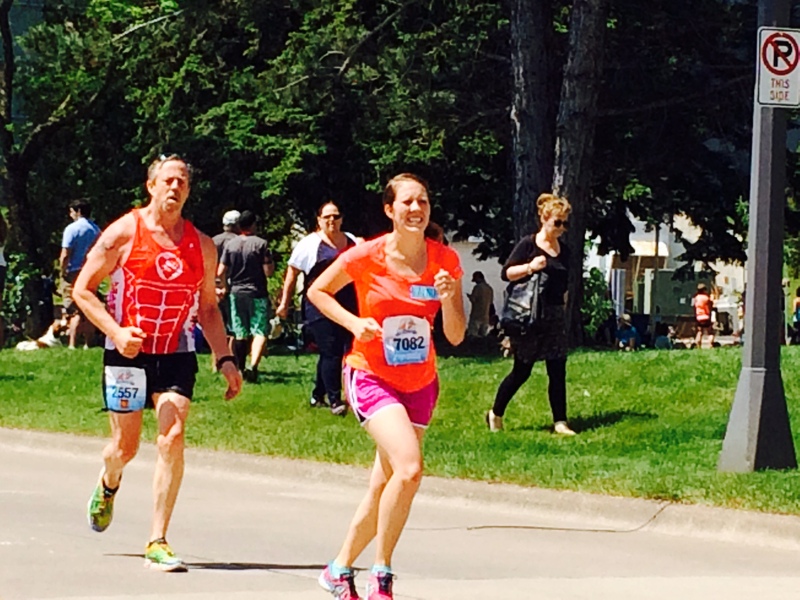 In the beginning, I only took up running to see if it would help strengthen my heart. Up until that point, I had always thought of running as a chore and wanted nothing to do with running itself; the goal was only to achieve the associated health benefits and when I first started to run, I experienced many fears spawned by the possible consequences to my heart. 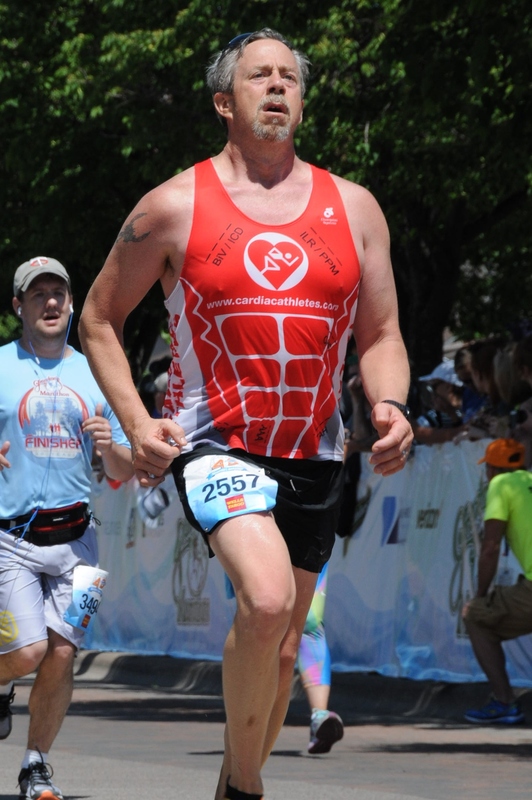 As a cardiac patient, they were logic fears but those fears always prevented me from experiencing the true joy that running is. To overcome those fears, I had to push beyond the boundaries everyone puts on a cardiac patient but those boundaries are often nothing more than fear and can be overcome as long as we are willing to make the effort. Each time I pushed a new boundary, I found a new fear. Some were warranted and required a visit to the doctor, while others I was able to work through by studying and self-educating myself to either put the fear to rest or find a way around it. 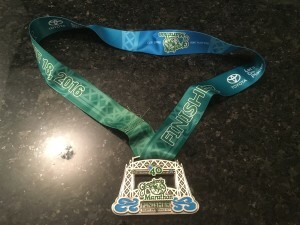 It took me three years and at times it seemed to be an endless process and there were times I wondered if I would ever get through it but in the days leading up to and culminating with this race I realized I had…. I cannot describe how incredibly powerful that feeling was. Running has now become a major part of my life and part of who I am. 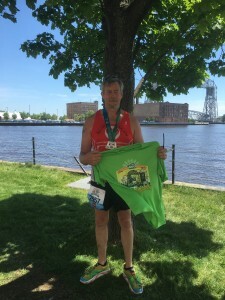 I have grown a really strong emotional connection with running I can’t fully explain at this point other than to say running restored my outlook on life as it strengthened my heart, mind and body. It was through running that I was able to turn one of the darkest periods of my life into one of the brightest. I no longer running to strengthen my heart. 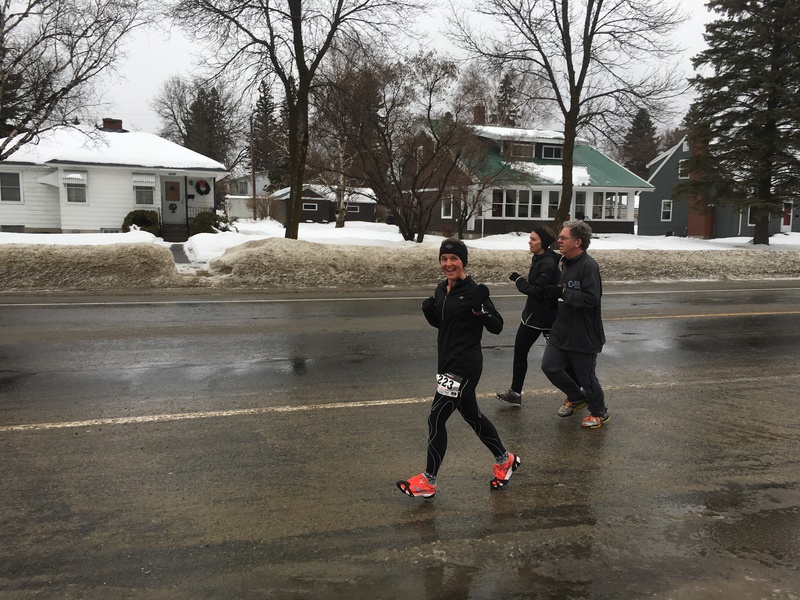 I run to celebrate the strength of my heart. I run because I love the way my body feels in an excellent state of health and fitness. I run because it clears my mind and gives me time to focus on the things in this world that are actually important to me. I run because it gives me an awesome feeling of freedom and control over my life. I run for the confidence it builds in me and how it continues to reward me through new adventures; all reasons not normally experienced by heart patients. Running is a celebration of my ability to live life to the fullest without getting hung up on boundaries. I plan to run as long as this body is able and allows. No matter which one of us wins in the end, (myself or heart disease), I will never again view myself as a victim of Heart Disease but instead choose to see myself as a victorious conqueror; a man who wasn’t afraid to fight back. This race will always represent a significant turning point in my life and a very emotional one, rightfully so. Every Medtronic Global Hero is a Pioneer in the world of modern medical technology. They are helping patients to eliminate boundaries that historically accompany a medical diagnosis . They are showing the world that a medical diagnosis doesn’t have to disqualify you from the race. Without these heroes, the world may never have known the possibilities available to us through technology and devices made possible by company’s like Medtronic so I would like to thank the people at Medtronic for what they do, because without medical technologies like theirs, my dreams wouldn’t have been possible. 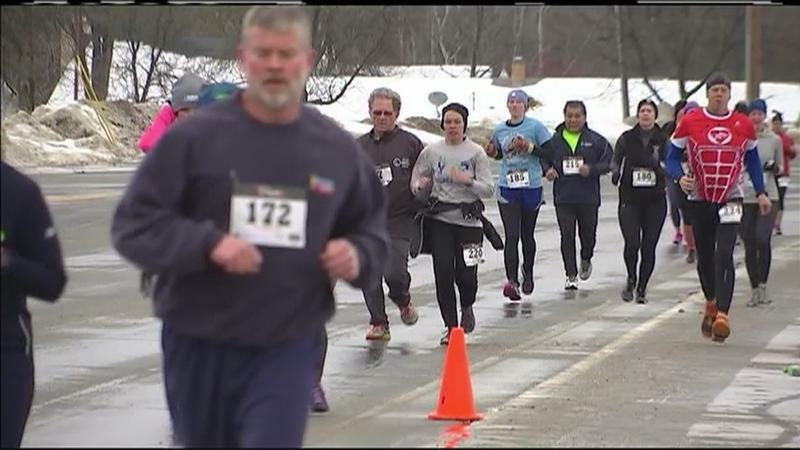 As a survivor of both Sudden Cardiac Arrest and Congestive Heart Failure, I would never have attempted any of this without the safety backup of my Pacemaker/defibrillator. My ICD keeps a vigilant watch over my heart even if I am not able; always watching, waiting to take over in the event my heart needs help. It’s become an integral part of me and allows me to pursue life with passion despite the damage to my heart. 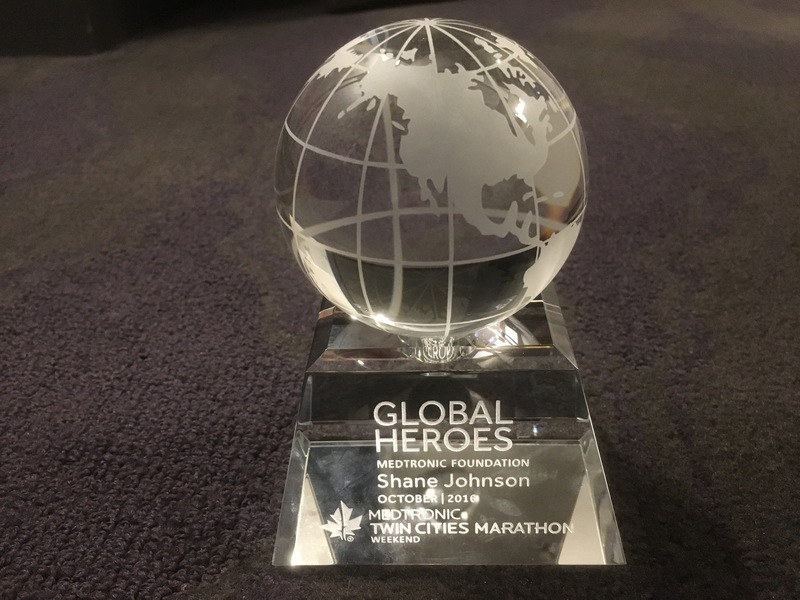 I truly can’t find words that describe how awesome it was to be selected as one of the 2016 Medtronic Global Heroes nor can I thank Medtronic enough for the opportunity to run in the Medtronic’s Twin Cities Marathon as a 2016 Global Hero. It was an experience I will never forget. So thank you Medtronic…. from the bottom of my heart.